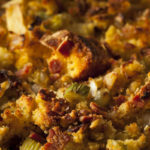 Growing up in Idaho, I had never had cornbread stuffing. In Idaho, it seems the potatoes are the star side dish, and the stuffing is a sad little side note. 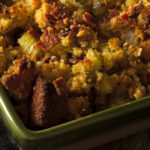 Well, that all changed as our family grew and my sister’s sister-in-law, Susan Hackney Richeson, started bringing the stuffing to Thanksgiving dinner. 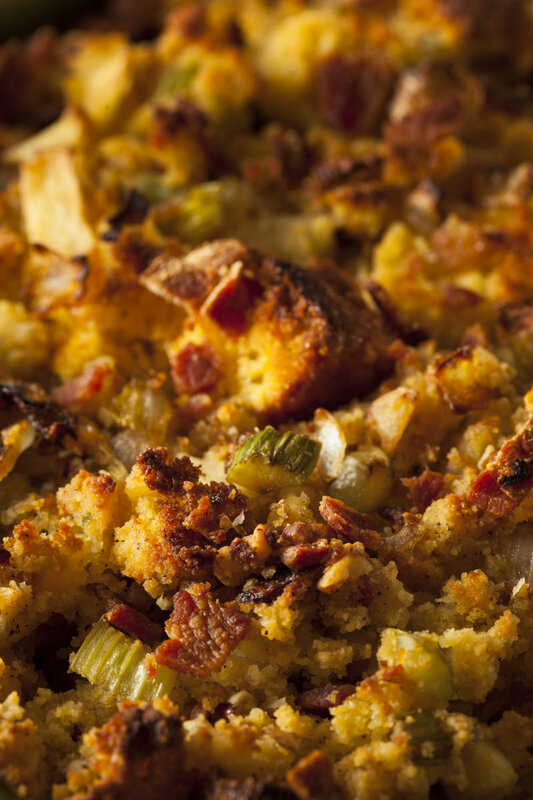 Now we all make Susan’s stuffing, and she is happy to share her recipe. 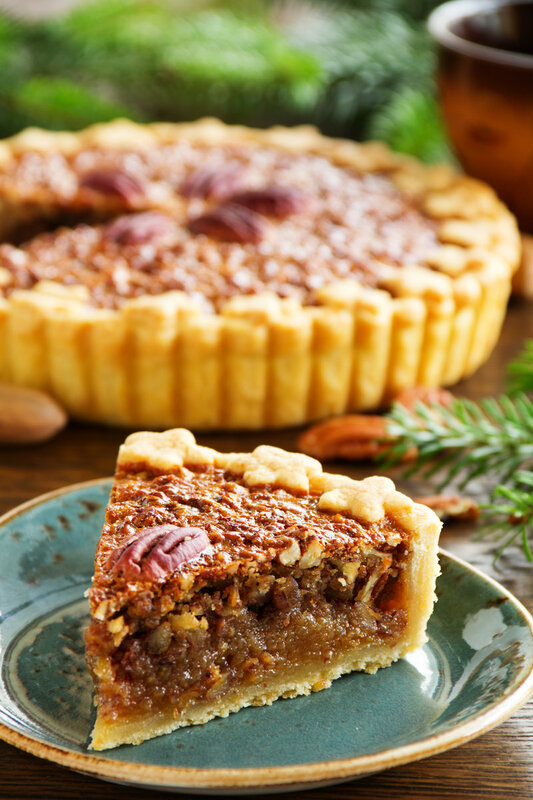 She also shares how this recipe came to be a family tradition. 1. The night before: Prepare the cornbread and let it sit out uncovered overnight to dry out. 2. The morning of: Saute the onions and celery in butter. Season with salt and pepper while cooking. 3. 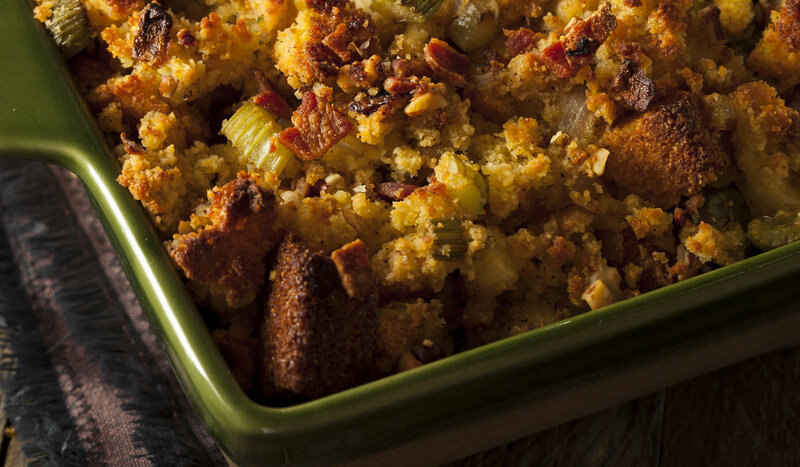 In a large bowl, crumble cornbread with your hands, add cornflakes, sauteed vegetables, poultry seasoning and a bit more salt and pepper to taste. 4. Once turkey is done, use drippings to moisten the stuffing; adding bits of turkey is optional. 5. Slowly add the turkey drippings to get the right consistency, similar to oatmeal. 6. Bake at 450 degrees until golden brown and set, about 25-30 minutes. 1. Toast chopped pecans on a baking sheet at 350 degrees for 12-15 minutes. 2. Preheat oven to 400 degrees. In a large bowl, beat eggs until foamy, and stir in melted butter that is cool enough not to cook the eggs. 3. Stir in the brown sugar, white sugar and flour; mix well. 4. Add milk, vanilla and nuts. 5. Pour into an unbaked 9-inch pie shell and bake for 10 minutes. 6. 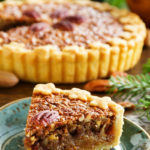 Remove from oven, top with whole pecans, then reduce temperature to 350 degrees and bake for 30-40 minutes, or until done.